Memorials are situated in all parts of a city, from civic centers to local residential neighborhoods, and they often serve as focal points for life in these communities. Memorials function virtually as surrogate graves for those who more often than not died far from the confines of the city. Allowing other people to enjoy your gift; especially those that have not been as fortunate as yourself enriches the community. Many times non-profit organizations spear head these types of memorial projects. That tends to make them more community minded and then you have the whole community taking pride in the project. Granite can be installed in any location in a residential or commercial project. The sophisticated appearance of granite in these areas helps to create an ambiance of strength, professionalism, and permanence. Granite creates a space characterized by refined beauty that complements the surrounding theme. Granite can be turned, cut , polished, and of course carved to and shape or form to meet and exceed our clients expatiation. We have done complicated sets of statues, fountains, benches and other custom design. Granite has a natural elegance and a large selection of one-of-a-kind traditional and exotic designs that will make your space as unique as your style and personality. All of our stones are top quality and inspected by our stone experts. Natural stone has been the building material of choice for centuries, so it is not surprising that to this day, it is used by architects and builders worldwide in various capacities. When working on any projects, it is important to know the properties of the materials, which will be used. Our memorial fountains provide places of solace and contemplation. Many may be appreciated for their aesthetic and symbolic value apart from their commemorative purpose. At their best and when most effective, they connect to a community and cause its citizens to reflect on something larger than themselves. As with the parks monuments, fountains have in a large part not been sponsored by government, but instead created by citizen initiative, and commissioned through private contributions. This process caused neighborhoods to have a stake in their local monuments, and many were dedicated with great pageantry before crowds of enormous size. Memorials fountains are far more complicated than any granite monument might suggest. They are processes involving a constellation of meanings, symbols, emotions, memories and narratives. Memorials are not inherently about reconciliation but they can come to be used to communicate reconciliatory messages. Want to know what your fountain will look like before you purchase it? 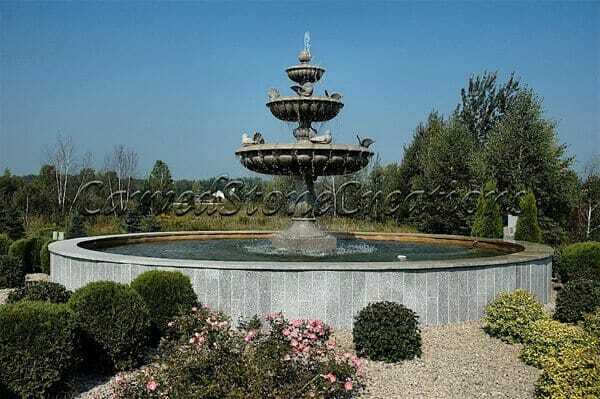 We can give you a free Photoshop presentation of the fountain you choose in your landscape!